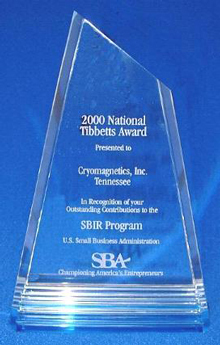 Cryomagnetics was honored in Washington D.C. on October 3rd, 2000 with a U.S. Small Business Administration Tibbetts Award. The program included a reception at the Hotel Washington, breakfast at the White House, and a Capital Hill Reception. Various officials from the Small Business Administration and elected officials attended the festivities. The Tibbetts research awards were established to give well-deserved, national recognition to those small firms, individuals, various organizations and projects that exemplify the business, economic and technological achievements of the Federal Small Business Innovation Research (SBIR) Program. Named for Roland Tibbetts, a former SBIR Program manager at the National Science Foundation, the Tibbetts Awards are an initiative of the Office of Advocacy in the U.S. Small Business Administration (SBA). World’s first pulse-tube cooled superconducting magnet system. Continuing research to commercialize a cryogen-free superconducting magnet system for Ion Cyclotron Resonance (ICR) research. Spinoffs from this project include some of the cryogen-free systems listed below in “Previous What’s New Pages” and positions Cryomagnetics to be a world-leading manufacturer of cryogen-free systems for physics, chemistry, and other research programs. Advancements in actively-shielded superconducting magnets allowing system placement in laboratories that could not handle the size and weight of older design, passively-shielded systems. Passively-shielded system weight is measured in tons. Cryomagnetics’ 7T actively-shielded superconducting magnet system for ICR research weighs approximately 800 pounds. Advancements in dewar design to allow cold-shippable systems. Setup time at the customer’s site is now measured in hours, not days. The American Museum of Science and Energy (AMSE) Tribute to Tennessee Technology Awards are designed to recognize those individuals who have developed a significant invention while working in the state. In addition, recognition is given to an individual or teams of individuals who have helped commercialize technology over their lifetimes or provided humanitarian service. The primary objective of these awards is to increase the awareness of the role technology plays in the state’s economy and the importance of Tennessee inventors in advancing technologies worldwide. Entries in the awards programs are solicited from across the State. The program was founded in 1997 by David Sincerbox, former director of AMSE. To date, 40 inventions and 165 individuals have received the prestigious AMSE Foundation Award and the associated trophy. Cryomagnetics was honored for development of a superconducting magnet system that is gaining popularity in the biological science research laboratories. This system, developed as an extension of technology Cryomagnetics acquired in working with NASA, has broken new ground on a number of fronts. The magnet system is at the heart of a mass spectrometer system that enables researchers to achieve resolution in molecular mass analysis never before achieved. Contact Cryomagnetics today for innovative solutions to your superconducting magnet system requirements.